CVS and Aetna. Amazon and Whole Foods. And now, Cigna and Express Scripts. It's hard to keep track of all the big companies that have recently decided to join forces or changed their names. Here's a guide. Last year, Amazon (AMZN) made a bet on physical stores and the business of food when it bought Whole Foods. Your neighborhood Whole Foods is still called Whole Foods. But Amazon has already changed the store by lowering prices and selling tech gadgets there, among other things. Arby's parent company Roark Capital purchased Buffalo Wild Wings, the chain of sports bars. Roark also has big stakes in Auntie Anne's, Carvel and Jimmy John's. Restaurant Brands (QSR), the parent of Burger King and the Tim Hortons doughnut and coffee chain, purchased Popeyes Louisiana Kitchen last year. In December, Campbell Soup (CPB) announced that it is buying Snyder's-Lance (LNCE), the maker of Snyder's of Hanover pretzels, Cape Cod and Kettle potato chips and Pop Secret popcorn. Campbell already owns Pepperidge Farm, which makes Goldfish crackers and Milano cookies. Olive Garden's parent company, Darden Restaurants (DRI), bought Cheddar's Scratch Kitchen last year. The new company, Keurig Dr Pepper, will combine Dr Pepper, 7UP, Snapple, A&W and Sunkist with Keurig's franchise of single-serve coffee pods, which includes the Green Mountain Coffee Roasters and The Original Donut Shop brands. The companies announced the decision in January. The cereal company picked up the organic pet food maker for $8 billion. In June, George Clooney sold his tequila company, Casamigos, to Diageo (DEO), the owner of Johnnie Walker, Smirnoff and Cîroc. Candy king Hershey is buying Amplify Snack Brands (BETR), the maker of SkinnyPop popcorn. Hershey (HSY) acquired jerky maker Krave in 2015. Cigna (CI), one of the country's largest health insurers, agreed to buy Express Scripts (ESRX), one of America's biggest pharmacy benefits managers, in March. 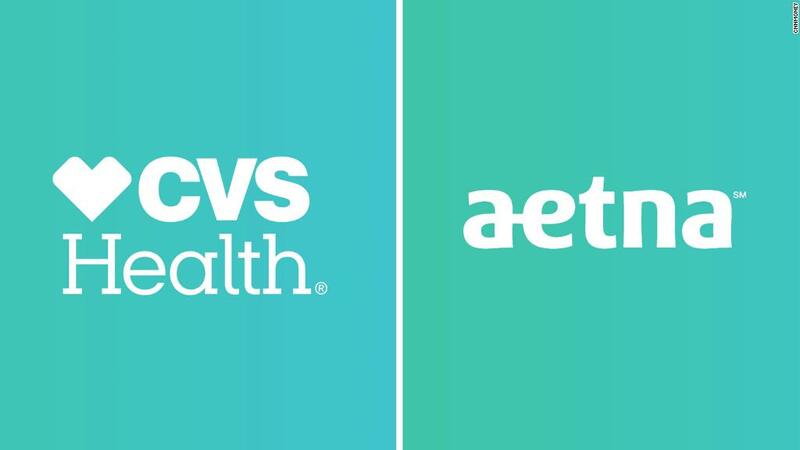 CVS (CVS) is acquiring Aetna (AET), one of the nation's largest health insurers. If the deal goes through, it would drastically remap the health care industry. The companies announced the plan in December. Over the summer, Yahoo and AOL became a new company called Oath. The change followed Yahoo's sale to Verizon (VZ), which also owns AOL. The deal was finalized last year. Disney (DIS) is trying to buy a huge chunk of 21st Century Fox in a deal that would help the entertainment giant fend off digital rivals like Netflix (NFLX). In addition to 21st Century Fox (FOXA)'s movie studio and regional sports networks, Disney would get cable channels FX, National Geographic and Fox's stakes in Hulu. Comcast has also put in a bid for part of Fox's assets. Meredith is buying Time Inc.
Meredith already published the magazines Parents, Shape, Better Homes & Gardens and will now have control of People, Sports Illustrated, Fortune, Entertainment Weekly and others. Last year, Sinclair (SBGI) put in a bid for Tribune (TRCO). The Sinclair-Tribune deal is waiting for FCC approval. The privately held grocery store company, which owns Safeway and Vons, among other brands, has agreed to buy Rite Aid. Albertsons hopes a Rite Aid (RAD) acquisition will help it grow its customer base and keep pace with Amazon and Walmart (WMT). Coach (TPR) bought Kate Spade last year in a bid to help lure Millennial shoppers. In the fall, Coach changed its name to Tapestry, though the store name and all the accessories it makes will still be labeled Coach. Michael Kors (KORS) agreed to buy the British shoe company Jimmy Choo in July. Bonobos clothing will only be available on Jet.com, the online marketplace that Walmart bought in 2016. Broadcom (AVGO) makes chips for modems, Wi-Fi, switches and routers. Qualcomm (QCOM), which invented the 2G and 3G wireless network technology used by Verizon and Sprint (S), has rejected the offer. But if the acquisition goes through, it would be the second-biggest deal in American corporate history.